On a rainy Friday night in late February, more than 150 people gathered in the Chandelier Room at Santa Anita Park to celebrate the lives of Noble and Beryl Threewitt, who had both passed away in 2010—Beryl in July, Noble in September. Noble would have just turned 100 the day before—Feb. 24. The memories shared that night focused on three common themes: the tremendous accomplishments of Noble as a trainer, his advocacy and humanitarian work for backstretch workers and their families, and the true love that existed between Noble and Beryl. I shared an office with Noble when I began working at the California Thoroughbred Horsemen’s Foundation. While I worked on the budget or prepared a presentation for the California Horse Racing Board about our declining income, which comes from unclaimed prize winnings, Noble had a constant stream of backstretch workers and other trainers visiting him. 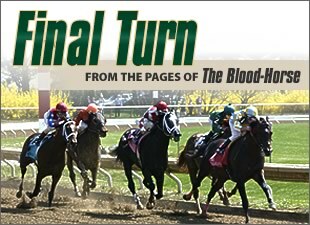 I had a front-row seat to some of the best storytelling in the industry: racing in Mexico (before it was legalized in California), the first opening day at Santa Anita, walking the first horse out of the trailer at Hollywood Park, meeting Mae West, the “real” story of Seabiscuit, a tale from one of Noble’s 2,000 winning races or about one of the many friends he’d made along the way. Racing to Noble, however, wasn’t just about the wins or the records he held. He cared most about the people in racing. Noble was known for carrying an extra $20 in his pocket while he walked around the barns just in case he ran into someone who needed a little help that day. After leaving the barns, he would come to work at the CTHF clinic. In 1983 Noble founded the CTHF, a non-profit, charitable organization that provides medical, dental, and vision care, as well as social services for backstretch workers and their family members. The foundation started as a small dental clinic at Santa Anita. The clinic, in a small modular trailer, got hauled to Hollywood Park for a season. With the addition of medical services, the clinic found a home outside of Gate 7, and in the mid-1990s the clinic expanded to a new facility, which is named in Noble’s honor. CTHF now has clinics at Hollywood Park, Golden Gate Fields, and Pleasanton, and provides services at Del Mar, San Luis Rey Downs, Pomona, and the northern fair circuit—anywhere Thoroughbreds race in the state of California. All of this was shepherded by Noble. During the five years I worked with Noble, more than 50,000 men, women, and children received medical or dental treatment at one of the clinics or through referral services. For many on the backstretch, CTHF has been and will be the only health care provider they ever know. Noble was always accessible to the backstretch workers and particularly loved seeing children in and around the clinic. Indeed, the clinic has provided treatment for some families for three generations. Through it all, Beryl was by Noble’s side for 77 years of marriage. Noble loved racing. Beryl loved the racetrack. She loved the energy and the people at opening day. She loved the winner’s circle, Bloody Marys at Frontrunners, and dressing appropriately for all occasions. Beryl was the strong, classy, determined, and lovingly opinionated woman that made Noble’s world possible. Beryl set Noble’s clothes out each morning. After dropping him off daily at the barn, Beryl would pick him up for lunch and drive him home for dinner. Finally, when she was in her mid-90s, the state took her driver’s license away. True to her character, she drove to the Department of Motor Vehicles, license-less, and would not leave until she had a new driver’s license. After all, she needed to get her hair and nails done every other week, go to the bank, and take Noble to the racetrack and the clinic. The CTHF is one of Noble’s greatest legacies to the racing industry. The staff at our clinics knows the work they do everyday truly makes a difference in the lives of the people on the backstretch—providing a strong and healthy foundation for the racing industry. He is remembered every day at the CTHF clinics where his “Noble” work continues.